The ShelterLogic Shed-in-a-Box 8 x 8-foot outdoor storage shed has a small footprint and big value when space is at a premium. Made from an all-steel metal frame that is 1-3/8 inches, the Shed-in-a-Box is tough and durable. The metal frame is bonded with a premium powder-coated finish that prevents chipping, peeling, rust, and corrosion. 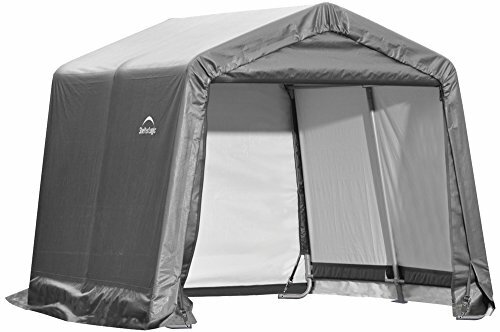 Patented ShelterLock stabilizers ensure rock solid stability that delivers a secure, more durable shelter. Shed-in-a-Box is designed for use in every season and can protect your equipment from sunlight, rain, tree sap, snow, wind and more. Features the Ratchet-Tite tensioning system that ensures the cover is tight and neat looking. The cover is UV-treated inside and out with added faded blockers that results in a fabric cover that withstands the elements. With a waterproof cover made from ripstop, the Shed-in-a-Box is sure to provide protection for your items. The high profile white interior provides enhanced illumination so you can easily find what you're looking for. For privacy, one accessible double zippered door panel and a back panel are included. Win back garage space with an affordable storage solution. With 64 square feet of storage space, the Shed-in-a-Box is great for storing garden tools, mowers, snow blowers, snowmobiles, ATVs, pool items, or anything you need to store out of sight. With a 1-year limited warranty, you can be confident in the quality of your purchase. Two people are recommended for assembly. Assembled Interior Dimensions: 7'9" x 7'9" x 7'11"